In honor of the last day of Summer, I thought I’d investigate the pumpkin craze that is sweeping the nation even before Fall begins. In preparation for the coming season, grocery stores are stocking up on pumpkin scones, pumpkin muffins, pumpkin cakes, oreos, coffee… you name, they’ve pumpkin-ized it. It seems like people are crazy for pumpkins these days. But really, the pumpkin fad has been going on a lot longer than you think. In fact, us humans inherited pumpkin fever from other animals that dominated North America (birthplace of the pumpkin) before we did. What animals am I talking about? Mastodons! 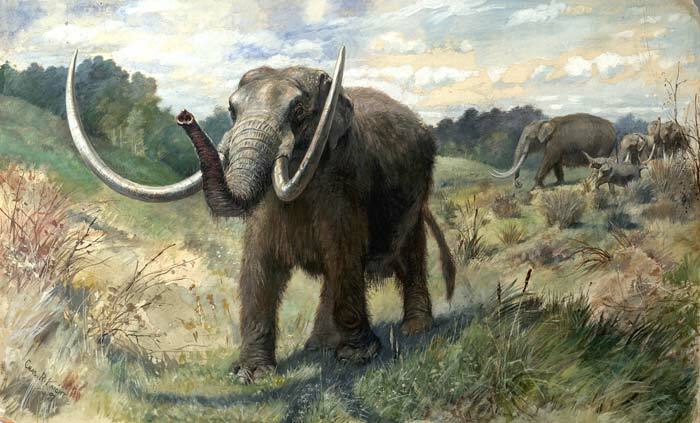 Restoration of an American mastodon herd by Charles R. Knight, 1897. A few years ago a group of scientists performing genetic studies on pumpkins found that some domesticated lineages of the genus Cucurbita (which includes pumpkins, squashes, cucumbers and gourds) are extinct in the wild, while others are restricted to only small populations in the wild, meaning that if humans hadn’t come along and domesticated them in time, all those pumpkin pies, cakes and decorative elements we take for granted wouldn’t exist. 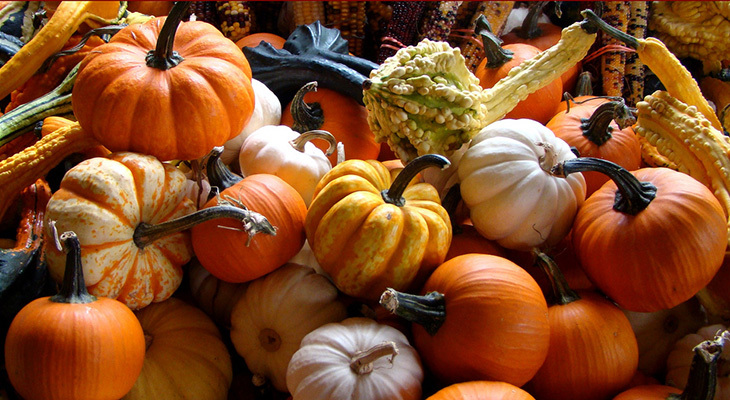 Can you even imagine what fall would look like without pumpkins? So how did a whole genus of plants almost go away forever? Well, the sudden die-off of many Cucurbita lineages coincided with the extinction of megfauna in North America about 10,000 years ago. Also, seeds belonging to wild ancestors of modern pumpkins have been found in preserved Mastodon dung, this all suggests that these animals may have been important seed dispersers for the plants. Image courtesy of the Falcon Times. We also know that the early pumkinoids were very bitter and toxic to most animals (as wild varieties of Cucurbita are today) and that only large-bodied animals such as Mastodons and Mammoths would be able to process all those toxins without being harmed. These giant animals also trampled down grasses and disturbed the soil, which probably helped the weedy pumpkin ancestors to grow. So when Mastodons and other large animals died off the Cucurbita family lost a major ally. In steps humans. Considering that early pumpkinoids and squashoids would have been unpalatable for us, nobody really knows what our ancestors used them for. Perhaps some Native American cultures discovered less bitter varieties and in hard times would use the not totally unpalatable seeds of those plants as food. Perhaps the plants were used in some non-food application. Either way, somehow or another, we figured out a way to breed them to become less bitter and toxic, gradually creating the pumpkins, squashes, cucumbers and gourds we know today. So next time you visit our Hall of Paleontology, don’t forget to thank our Mastodons (we have 2) for giving us pumpkins!